Beau patiently waiting to go home a few hours after surgery. 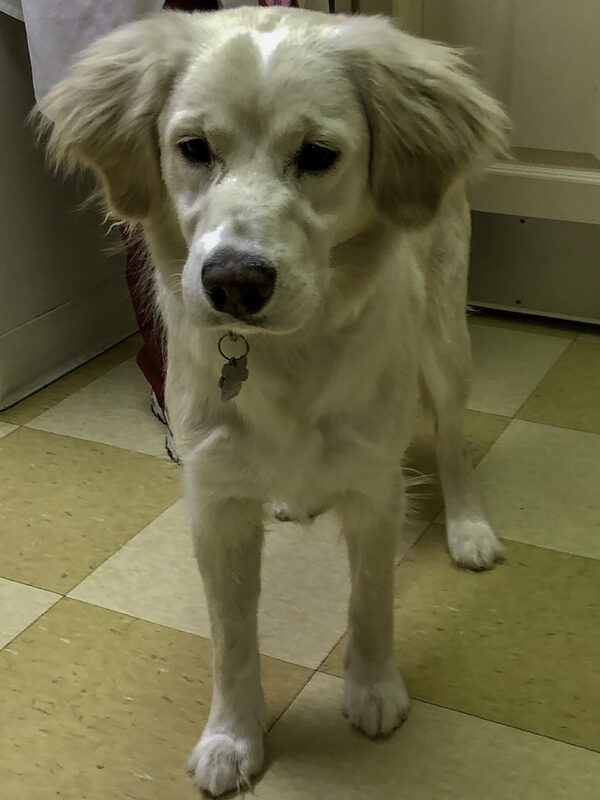 This sweetheart is 8 month old Beau – waiting to go home from his neuter surgery earlier in the day. Beau’s surgery was a little more complex than normal because he was what we refer to as ‘bilateral cryptorchid’ – his testicles hadn’t ‘dropped’ into the scrotum. In other words, both of his testicles were still inside his abdomen. 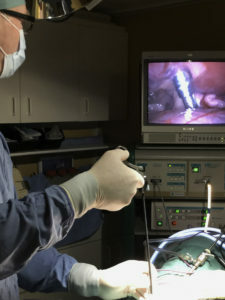 Using laparoscopic or minimally invasive techniques and equipment, Dr. Palmer is able to actually see the retained testicle and bring it up to the body wall where it can be removed through a small incision. Since ‘retained testicles’ can be anywhere from near the kidney to the inguinal canal, they can sometimes be hard to find surgically. It is important however for retained testicles to be removed since they will produce testosterone (leading to the same health risks and behaviours as seen in un-neutered male dogs) and they can be at a higher risk of developing tumours as the dog gets older. Fortunately, Dr. Palmer can use the same technique and equipment that we use for our Lap Spays to find a testicle in the abdomen – making the surgery faster and with smaller incisions than what would otherwise be needed. Beau’s surgery went very well and he was able to go home just a few hours later. Aren’t those ears adorable? ?